The Commission acts as the filing officer for, and auditor of, financial disclosure statements filed by political candidates, committees, campaign consultants, permit consultants, major developers, lobbyists and designated City and County employees and officers. Disclosure statements are public records and are available for review on-line. Some documents posted on-line are redacted. To view unredacted documents, please visit the Ethics Commission’s office at 25 Van Ness Avenue, Suite 220, San Francisco, CA 94102 or the Government Information Center at the San Francisco Main Library, 100 Larkin Street, 5th Floor, San Francisco, CA 94102. View charts and graphs that summarize campaign finance data. New to campaign finance research? Start here. Use the Commission’s disclosure resources to follow the money in support or opposition of candidates and local ballot measures. Additional resources are accessible via the Disclosures Menu. Browse directories of contact lobbyists, firms, and clients and search transactions on reports. 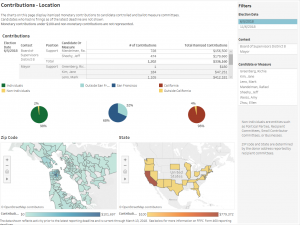 Download contact lobbyist data or use the data to build maps, charts and graphs. View publicly disclosed statements of City officials participating in government decisions. Use the SODA API to query the campaign consultant data for use in an app or web application. Use the lobbyist API to query the lobbyist data for use in an app or web application. Use the SODA API API to query the Statement of Economic Interests (Form 700) data for use in an app or web application. The Ethics Commission's Records Management Policy governs the Commission's records maintenance and destruction schedule. For more information about historic records or records in off-site storage, call 415-252-3100.